In the last 6-7 years, we have seen a significant spike in the number of students coming to school with severe behaviors Many are simply not ready to learn. While I have my theories as to why we are seeing this large uptick, I am certain that this is a societal issue that is not going away soon. More and more children with mental health concerns are entering our schools and quite frankly, we are not prepared enough to help them. Many people would say that it is not the job of schools to deal with mental health and that it is the parent’s role to ensure that their children are ready to learn. Some would even say that if children are not, then we shouldn’t let them come to school. That could not be further from what children need. For many children, schools are the only place they can feel safe and cared for by trusted adults. Moreover, the biggest problem is not the changing student population, it is how quickly we can learn how to help these struggling students. Here is what we know…most children can be taught to regulate their own behavior and to develop trusting relationships with others. You likely know that children with adverse childhood experiences, or trauma, have extreme difficulties making decisions on how to appropriately behave because they can only “feel”. Their responses to challenging situations are driven by their limbic brain where fear resides. They can only “fight or flight”. Thus, they become extremely dysregulated. We can teach children to regulate their behavior and to better deal with difficult situations, but we simply don’t know how to do that. We were trained to work with students who are using their prefrontal cortex, the part of the brain that is used for decision making, by asking them questions like: “How do you think that makes him/her feel?”or “Was that a good choice or a bad choice?”. This logic based approach will not work with students who can only feel. In order to educate our students, we must teach the whole child. To do so, we need to learn how to help students with struggles that are new to us. We need to learn why students have these needs and to develop a common framework and vocabulary for helping them to succeed. I believe that when we do so, we can actually help to teach students to regulate their behavior. Furthermore, schools need help, and a lot of it. We can do this, but a system of mental health support that is integrated with schools, coupled with ongoing training for teachers and staff, is essential to meeting our students’ needs. Senate Bill 266 is something that can help us. It is designed to increase funding for schools to help students dealing with mental health issues as well as funding for teacher preparation programs to provide instruction to future teachers. Senator Crider, R-Greenfield, authored SB266 and it passed the senate by a vote of 29-20. The article in Hendricks County Flyer can get you up to speed a bit, but suffice it to say, I believe that we need help…and a lot of it. SB266 gets us going in the right direction. One of the many things our school was proud of was our professional development program for teachers. My experience prior to the principalship was steeped in capacity building and adult learning theory, so bringing my growing abilities to bear helped to find processes where teachers were motivated to continually improve their instruction. What they did, how they supported one another, and how they grew, was a daily inspiration. We had our ups and downs with standardized assessment results, but the trends found us making moderate improvements with student learning and achieving at a relatively high level among other middle schools in the state. Strong teaching was a focus, and boy did that school have an abundance of excellent teachers. This is my thirtieth year in public education, so I can say I’ve been around the block a few times. 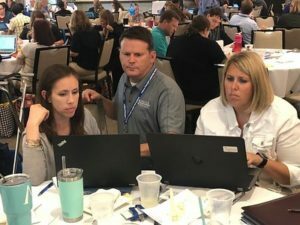 Being a part of many professional development and program initiatives designed to impact student performance has been a regular part of my experience. The thinking was that if teachers would teach better, students would learn more. Most always, we started the improvement cycle by looking at teaching. I’m not saying that is a bad thing, we’ve just been doing it backwards for many years. Have you ever seen a great teacher who works hard, captivates the attention of his/her students on a regular basis, and is in command of a large toolbox of research-based instructional practices? I’m sure that everyone has had some of those teachers. Have you seen a teacher like that, who when standardized assessment results came in were surprised by the results…some years increasing and some years not? The years where scores didn’t improve may even have found that teacher mildly depressed. They had worked their tail off for 180 days, and the performance they sought from their students was still elusive. I’ve found that this problem is usually not a teaching problem, which is what I was geared to solve. The problem of elusive results, I believe, is a learning problem. Let me explain. I’ve often asked teachers this question: “In the absence of learning, does teaching exist?” That elicits many thoughts and emotions. 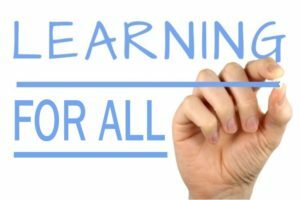 There are a plethora of teachers who exhibit strong instructional abilities day in and day out with their students; however, is it possible that their students are not learning at the levels they need to learn? To get to the root of this enigma, one must come to an understanding on what we believe to be the definition of teaching. “Teach” is a verb and Merriam-Webster online notes that it is “to cause to know something…to cause to know how”. I am drawn to the two words: TO CAUSE. I may have done some great “teaching” but if students didn’t learn, I didn’t cause what I had hoped. To cause something to happen takes purposeful work, collaboration, and a system…especially if what you are wanting to happen is difficult and complex. Our recipe is still simmering, but we have found that PLCs, coupled with a guaranteed & viable curriculum, is our best hope to ensure learning at high levels for all students. This symbiosis, where we can know each student’s proficiency at each topic level, makes our vision of learning for ALL possible. Joel Barker said it best when he said: “Vision without action is merely a dream. Action without vision just passes time. Vision with action can change the world.” I strongly believe that our symbiotic actions can actually make our vision a reality! How did I come to this epiphany? It started with my exposure to some amazing minds as a mentor for both Cohort 1 and Cohort 5 of the Indiana Principal Leadership Institute. IPLI has been a wonderful experience for me. Through action research and exposure to ideas outlined in the High Reliability Schools™ framework, I have had experiences that sparked a change in the way I see instructional leadership. Of course, none of this is novel. I have learned from exposure and study of Marzano, DuFour(s), Heflebower, Schlechty, Mattos, Hoback, Hoegh, Rains, Warwick, Dweck, and Hattie. What I learned since leaving the principalship is that focusing on improving teaching first, and then expecting learning to increase, can only get a school so far. Believing that all students can learn at high levels and not focusing on students and their learning first is nothing short of a pipe dream. It’s fanciful and quite frankly unobtainable. I believe that all kids can learn at high levels. A curriculum that provides an opportunity for all students to succeed within the time provided for that course. A crystal clear definition of what proficiency looks like at each and every topic level. Know the basic skills that are precursors to proficiency AND we will know what it looks like to extend learning for students who reach proficiency quickly. Involve students in understanding where they are and what they need to work on next in each learning progression. We have the opportunity to work as a team for 13 years to achieve high levels of learning for ALL students. I was fortunate to visit a couple of elementary classrooms this week during nurture group and I was heartened to see students engaging with one another and practicing skills to help them self-regulate and stick together. While we have a lot of work yet to do, I am enthused that we are focusing more on meeting the social and emotional needs of our students. At one point in my visit, students were expressing their differences through telling their classmates of their fall break plans. Each student felt free to express their ideas and excitement, even if it was simply staying at home to achieve the 30 goals in Mindcraft they had set for themselves. The differences in what kids thought exciting was totally accepted by the class as was evident in the expressions of all who listened. There was no judgment. The social walls that are typically created, yes even in fourth grade, were not visible to me at all. At this point, a memory came to me from my time as a middle school administrator. My family and I were eating at Logan’s, and at a table across the room was a CGMS student with his family. At school, this student was quiet, maybe shy, and did not engage with others. He was not one who many thought to include in their social circle. However, in the restaurant that evening with his family, he lit up!. He laughed and talked the whole time. His gregarious behavior was reflected back by his entire family. I remember being deeply sad that he had to put so many walls up at school. This week, Brené Brown’s new book, Dare to Lead, was released. I’ve been excited to get it ever since I pre-ordered it some time ago. At one point, Brené is talking about the armor that students wear at home or at school. A small snip/paraphrase is below. We can’t always ask students to take off their armor at home or on their way to school. What we can do, what we are ethically called to do, is to create a space where all students can walk in and for that day or hour, take off the crushing weight of their armor, hang it on rack, and open their hearts to truly being seen. We must be guardians of a space that allows students to breath, be curious, and explore the world and be who they are without suffocation. They deserve one place where they can rumble with vulnerability and their hearts can exhale. We should never underestimate the benefit to a child in having a place where they can take off that armor. It can and often does change the direction of their lives. It is SO HARD for many students to open their hearts to truly being seen. The polarization of our society and the ability to hide behind the walls of social media, compounds the issue of being safe and vulnerable. Brené shares that you can’t fully grow and contribute behind armor. It takes a massive amount of energy just to carry it (armor) around. I applaud the quadrant two efforts of our teachers. Those who assume the responsibility in being a part of whole-child education are our rock stars. Every student in our district is a child who is growing both socially and emotionally, and their ability to demonstrate vulnerability and courage opens wide the doors to lifelong learning. My Great Uncle, HT Hogan, passed away yesterday. He was a wonderful man with a spirit that brought energy to everyone around him. He was wise, warm, humble, and a wonderful singer. The trio of he, Aunt Mary and Randy (their son) still sings to me as it is their voices I hear when I replay “Inside the Gate” or “Feeling Mighty Fine” in my mind. Memories of Uncle H flood my consciousness from his gentle conversations with my father on Thanksgiving Day to me sitting in the balcony of the Bicknell United Methodist Church listening to him sing with his wife and son. I was certainly blessed to have him as an exemplar during my formative years. In my eyes, my Uncle H lived a life of greatness, but another part of that greatness is that he is the last of his generation to leave our earthly family. How I admired my many Great Aunts and Uncles! They were amazing models for all of us and I’m glad that my son got a chance to meet some of them. The world is a better place because of them. What I wouldn’t give to get in a time machine and go back to Thanksgiving at 703 N. Main in Bicknell, Indiana for one more time. A friend recently got me thinking about articulating my beliefs regarding teaching & learning. While I may add and edit later, my quick jots are below. I find that I am driven by my beliefs. Hopefully, you share one or two of them yourself! The historical approach to school improvement is to build teacher capacity first, and then expect student performance to increase. This of course works, but only to a certain level. For all students to succeed, you must first be focused on student learning. To do that, we must be crystal clear on what students should learn and what that progression of learning looks like for each topic within a course. The only way to accomplish this is to have a clearly defined curriculum. How would kindergarten be different if all students entering had the same high-level preparation? What about the other 12 grade levels? In the absence of learning, teaching does not exist. This is not to say that high-quality instruction didn’t take place. This only emphasizes that to teach is to change. Of course, students play an important role in the learning process, but that doesn’t mean that the teacher should ever shirk his/her responsibility to help students grow to their potential academically. If a student hasn’t learned, it just means that they have not learned yet. If a teacher hasn’t figured out how to reach that student, it just means they have not figured out how to do that yet. Professional Learning Communities are vital to extremely high levels of student learning. A system where teams of teachers focus on student learning based on a clearly defined learning progression, provides the impetus to discover new instructional avenues that meet the needs of the “not yet” proficient student. It also helps to provide an avenue to purposefully look at students who are ready to be enriched. A grade should reflect student learning. Traditional grading is at least a mildly ambiguous system. In most instances, the criteria for a grade varies from class to class. We all know that an A in one teacher’s class is not always equal to that same grade in another teacher’s class. I like reporting A-F, but to have a high degree of integrity, we must back our reporting with a strong correlation to our corporate vision of student learning. Homework is an important part of learning. My friends at CGMSC helped me to cement this belief. I believe that homework should only be assigned when teachers are confident that all students have enough knowledge to work on their own with limited support from the teacher. A good way to measure the quality of homework is to see a strong correlation between homework success and success on tests and quizzes. Oh, I absolutely hate work/homework that is designed to be “busy work”. As good as we are, what would It take to make us better? I heard this tenet years ago and it struck me in many different ways. I saw it as motivation to improve…to “get better” even though one may already be “good”. I also saw it as a shield to complacency for those who are reluctant to change in a world that is transforming right before our eyes. In the years since hearing this phrase, I have found even more meaning in this tenant as it aligns with my belief that the best teachers are the best learners. Simply put, I believe that we must strive to improve…every chance we get. When Pablo Casals, Spanish born cellist, was asked at age 90 why he continued to practice, he replied: “Because I think I’m getting better.” Why did he feel he needed to get better at age 90? He was already extremely well accomplished. I contend that his mindset, his belief, didn’t allow him to be “good enough”. I like to think that he knew of no other way to live his vision of music performance excellence, other than to continually strive to improve his art. I’ve had the pleasure to work with many Pablo’s in my career. Ironically, I have seen those who jump first at voluntary training are already the higher functioning professionals. Why is that? Well, the best teachers are the best (and most motivated) learners. Hmmm…does that mean that the best teachers need the least support? No! I believe that those with the largest appetite for knowledge need the most attention as they have more power to pull their colleagues “up” as they learn. About the same time in my life that I heard the tenet mentioned in the first paragraph, I met someone who would become a strong mentor for me. In a session of the Indiana Principal Leadership Academy many years ago, I remember hearing Todd Whitaker’s principle that when you work with your superstar teachers, your ability to positively impact the entire staff could be much greater. Dr. Whitaker will tell you that the “mediocres” best chance of improving is through their witnessing of trusted and respected colleagues catching on and adopting change. Ron Clark refers to those who are reluctant to change as “sitters” on the bus. We are in the change business! We don’t have to stop the train to get everyone on board first, but we must remember that once we have a critical mass willing to move forward, it’s time to get the wheels spinning! With support and strong focus of keeping the train on the track, most of the others will catch up.